See Star Formations Through A Punched "Sky." See star formations through a punched "sky" with this fun painting and gluing project. 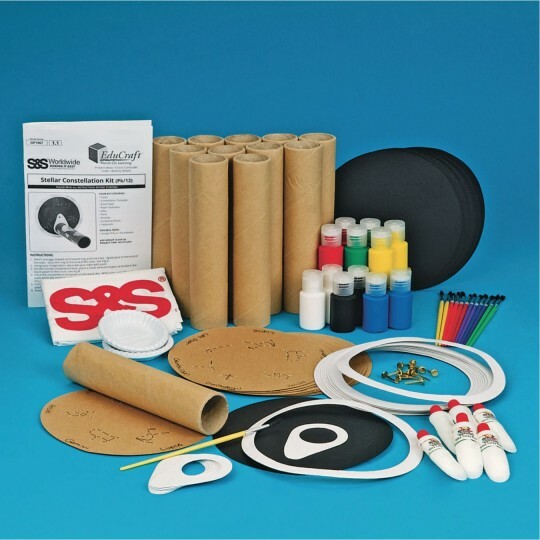 Includes a prepunched paper guide disc, tubes, glue, brushes, paint and paper fasteners. 7-1/2"L x 6-1/2" diameter. This project was enjoyed at our summer camp for ages 8-12. It turned out to keep their interest. These can be tricky to put together. The end piece shown in yellow but now white is a better fit than it was last time I used these a few years ago but still a little tricky to attach. We used pushpins to make the holes. I used these for a Cub Scout camp activity. They were very easy to assemble and use. The scouts loved them. Better for a claa project than camp. 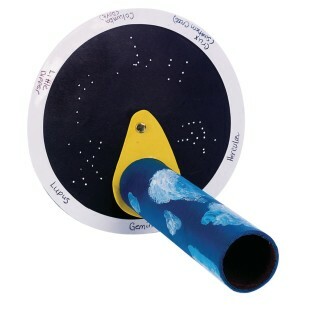 I used these for camp but they are better suited to a classroom setting with instruction in constellations and/or Greek mythology. The yellow ovals don't fit well on the ends of the tubes so I used hot glue. Other than that the kids ages 8-10 were able to follow the directions and complete the projects. I would recommend this to teachers but not necessarily for a camp or VBS project.